Not long ago, we read the post of a “horse trainer” upset over a horse whose neck was broken while the owner was trying to teach it not to pull back. The “horse trainer” was bemoaning the beauty of the little filly just the week before. No doubt a dead horse is unpleasant and possibly could have been avoided. However, the owner of the dead horse was at least attempting to teach it not to pull back. A horse that suddenly sits back and snaps halters and ropes is a danger to anyone in the immediate vicinity. A small child or elderly person could be badly injured or killed as the horse backs over them. A horse that isn’t disciplined and properly trained isn’t “beautiful” no matter how much eye-appeal there may be. It’s a hazard. Horses are sometimes hurt or even killed in training just like high school football players are sometimes injured and die during practice. It’s a fact of life. Unfortunately, many “horse trainers” aren’t trainers at all. If they won’t teach and discipline their horses, the horse isn’t being trained. In society today, discipline is a “bad” word. It shouldn’t be, the word “dressage” is nothing more than discipline. A horse properly trained and disciplined is much happier than the one who isn’t and much safer to have around. To the extent, injuries can occasionally occur during training isn’t a good reason not to train your horse. If your horse doesn’t know how to quietly stand while tied, he needs to be taught. If not for your own safety, then for the welfare of everyone else. This Little Guy is Hilarious If You Need A Good Laugh! We ran across this video on Western Dressage of Oklahoma’s Facebook page. It’s funny!! How Can I Find The Right Horse? Want to know how to find the right horse for you, check out Shawn’s thoughts. See the article at the Cherokee County Saddle Club’s web page. Good teachers can connect with their students and grasp the struggles the students face in learning. Good horse trainers do the same thing and understand the problems horses encounter during the training process. Without the capacity to see issues from the view point of the student or the horse, the training is not effective. Take a bridle and bit for instance, do you really recognize how it works and the confusing messages that can be sent to a horse. Judging from the blog posts we see and the comments we hear, not many people appreciate the torture a horse endures at the hands of an inexperienced “trainer”. Bits inflict pressure and/or pain depending on the type and the manner used. If you don’t know how to properly use them, when to use them, and the type to use, you have no business trying to train a horse with them. Try this simple test and see if it helps you better understand bits from a horse’s perspective. Using a small, light weight chain, put it around both of the wrists of your spouse leaving about 14 inches between the wrists so the arms can move. You can tie the loops with a small piece of wire so it won’t fall off either wrist. Make sure you have about six feet remaining connected to the chain you just attached to the wrists. Use only the end of the chain to request what you want. Stop all verbal communications. Just like the horse, pretend you don’t understand English. For the next four hours, any action the trainer “you” wants to do; get a drink, perform a household chore such as loading the dishwasher, mowing the yard, or whatever can only be done with your spouse performing the task. The only means of communication to explain what you want is the chain. No speech, no facial expressions, and no gestures. All you the “trainer” can do is pull, twist, jerk, or move the chain. The only thing 99% of you will be able to accomplish is a divorce! And this is with the person who knows you better than anyone and understands your needs. Now put yourself in the shoes of the “dumb” horse who has no clue what his “trainer” wants to accomplish as he sets there yanking on the reins. The bit in the horse’s mouth doesn’t feel any more comfortable than the small, lightweight chain around the wrists. The horse has to learn what the trainer wants from a few words in a language the horse doesn’t speak, the bit in the mouth, and leg pressure applied at various times as body weight is shifted. And people expect in 60 -90 days, a horse should be fully trained and ready to go. If you can’t think like and understand a horse, you really have no business trying to train one. Despite the desire to say you “train” horses, the truth is you only confuse them. We recognize anyone “can train horses”. It doesn’t require a license or formal education. Any wanna be horse trainer can learn it on the job, reading books, and watching videos. Better yet, they can attend a weekend long clinic hosted by a horse whisper or famous clinician. Do the poor horse a favor when you get back from the clinic, see if you can pass the test with your spouse before you go to work on the horse. Funny, our society won’t even let people trim the ends of your hair without passing a test. But, no worries, if you can’t pass the test, you can always yank on the bit and call yourself a horse trainer. This post probably sounds a bit rude and impolite. We don’t mean to sound unfriendly, but we would like folks to see things from a different perspective, that of the horse. One more thing, before you take our test, make sure you have the name of a good divorce lawyer. The horse may have to put up with you, but your spouse doesn’t. If you have a horse that rears up habitually, it is a serious and dangerous problem. It poses risk, not just to the rider, but others in the vicinity as well. The horse may fall over from losing its balance or deliberately rear high enough to flip over backwards. An 1,100 lb. animal is going to hurt anyone it lands upon (unless you happen to be lucky enough to have some mud or really soft dirt). Some horses learn to flip over because it is an effective means to end the day. Many riders won’t get back in saddle once a horse goes over and the horse quickly it figures out. The average person has no business trying to ride, train, or work with a horse that regularly rears up. It should be addressed by an experienced trainer who knows how to stop the problem. If it can’t be fixed, the horse needs to be put down, not taken to the sale barn where some unsuspecting buyer gets hurt. Jodi Wilson, a professional horse trainer, has a good article on rearing. She argues against the practice of intentionally pulling the horse over backwards to teach it not to rear. We agree and especially for those who don’t know how to do it. Pulling a horse over carries significant risk. We care far less about the risk to the horse than the rider, but either way there can be some bad results. Is pulling a horse over an effective means to stop it from rearing? It can work sometimes. If it doesn’t, you can end up teaching the horse to fall backwards with a rider, thereby increasing the potential risk for harm. Bottom line – we agree with Ms. Wilson, any horse that rears needs to be taught not to rear up for the safety of everyone. The horse needs to be trained by a qualified professional to break the habit. There are several methods an experienced trainer can use to resolve the problem. We want to take a moment to thank you for following horsesfortrail and to wish you a wonderful New Year! 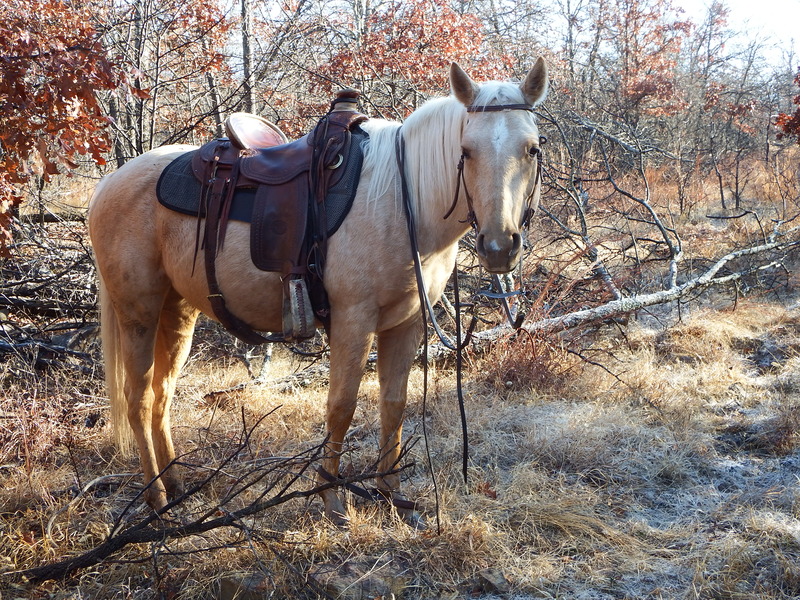 Make sure this coming year that you reserve plenty of time on the trail with a good horse! You are currently browsing the horsesfortrail blog archives for January, 2014.